It’s easy to see why Redwood City (CA) Public Library (RCPL) was designated the top-rated mid- to large-sized library in the entire country for five straight years. Its host of early literacy programming alone establishes the institution as a leader in education and outreach. Among the many people that make RCPL’s programming a success is Jan Pedden, who directs the library’s Traveling Storytime program and its parent education classes and storytimes. These literacy programs are a much-needed resource in a community where only 42 percent of third-graders are reading at grade level. As a former reading specialist who’s worked with thousands of school-age children experiencing reading difficulties, Pedden understands the importance of providing quality early childhood programming for children before they enter school. But finding ways to reach the children who could benefit the most from this programming poses a sizable challenge. The team at RCPL created Traveling Storytime to bring outreach programming to childcare settings throughout their community. The program is staffed through volunteers, who make 40 to 50 visits per week to daycares and preschools, including Head Start locations. The staff has set up the program to be easily managed: volunteers simply stop into the library to grab storytime bags prefilled with 6 books, flannel boards and finger puppets, as well as a binder filled with songs, stretches, rhymes and activities. Each volunteer is assigned to a specific site that fits his or her location, day and time requirements; several of the volunteers have delivered storytimes to the same sites for 15 years. 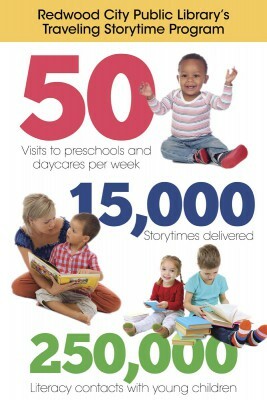 Over these past 15 years, the program has delivered more than 15,000 storytimes and promoted 250,000 literacy contacts between young children and storytellers. 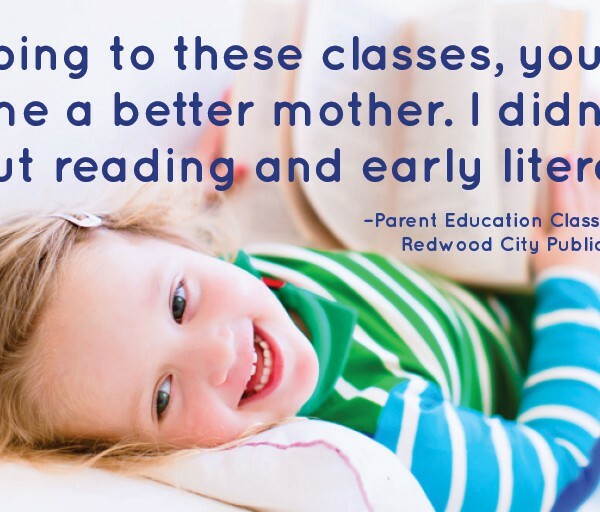 After attending training on early literacy from experts in brain development, Pedden knew that taking a deliberate approach to their early childhood programming was critical to enhancing its outcomes. This included integrating The Very Ready Reading Program, a literacy-focused storytime curriculum, into RCPL’s early literacy programs. Pedden utilizes the themed lesson plans, book suggestions and caregiver handouts from the program, which feature simple ways caregivers can integrate early literacy into their everyday activities, as well as the songs and rhymes used during storytime, so caregivers can reinforce learning at home. The Very Ready Reading Program has also been infused into the library’s parent education classes, which are delivered by former teachers, as well as the library’s regular storytimes, where storytellers weave early literacy tips for parents and caregivers into the program. All of RCPL’s early childhood efforts are based on what they call the 3 Es of Early Literacy, a philosophy centered on creating learning opportunities for caregivers and their children. RCPL’s parent education classes walk parents through early literacy tips and explain why they are important. For example, teachers discuss the benefits of sharing nursery rhymes with children, including how exposing children to rhythm and rhyming words promotes phonological awareness. Their parent education classes are so popular that RCPL has had to limit the number of people who attend. They offer several different classes during the week with a class size of 25 caregivers and 25 youngsters, but they can draw up to 120 participants during their two-hour early literacy education and participation program on Sundays, which attracts parents who only have their kids on the weekend or who work the other six days of the week. Parents are offered encouragement not only from library staff but also from the community of parents and caregivers that RCPL has helped to nurture. Storytime practitioners use craft time at the end of the program not only for additional learning opportunities but also as time for parents to socialize and build a sense of community. Multiple programs and class times are offered and the rules are loose, with no restrictions on noise levels or food. “There’s a real sense of community, and people come and stay,” says Pedden, who has witnessed the strong bonds formed in storytime, including parents who have come together to celebrate births as well as to help one another in times of crisis. 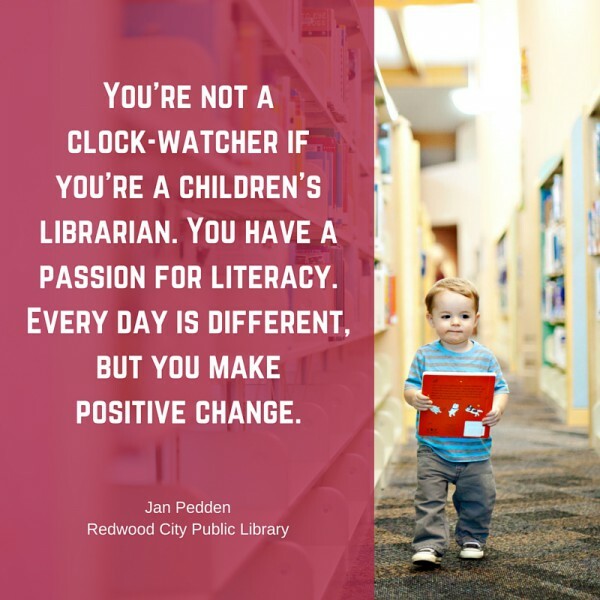 Along with providing tips and modeling early literacy behaviors for caregivers during storytime, it’s important, Pedden stresses, that every child leaves with a brand-new book after every Parent Education class. Pedden stresses the importance of having programs that meet best practices and don’t take extensive training. As new staff join the library, it is crucial to have programming in place that won’t need to be created from the ground up and funding that has already been established for a time through grants, donations and Friends groups. Members of the community also give financial support, as well as volunteer their time, including several local teens who are eager to help further the library’s goals by volunteering their time on their early release days to read to children at their former elementary schools. One teen’s volunteerism has even earned him a spot on the International Literacy Association’s 30 Under 30 List. Ryan Traynor started volunteering at RCPL when he was only 11, sharing stories with children in low-income preschool classrooms in both English and Spanish. 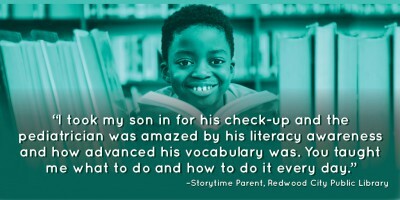 But he didn’t stop there; after seeing a need to place more books in the hands of children in his community, he organized a series of book drives that eventually resulted in 30,000 books donated to schools, shelters, and of course, Redwood City Public Library. Although it’s not always easy to quantify the outcomes, it’s clear that RCPL’s efforts are making a difference, including an increase in the number of books participants check out after attending programs. Pedden, an expert in literacy assessments, says taking a more formal approach to measuring outcomes poses difficulties. It’s a challenge to administer formal tests to children who can’t read yet, especially in a non-school setting, and observation and parent surveys pose their own issues because the library doesn’t always see the same participants each week. However, there are plans for a more formalized approach. As part of the Public Library Association’s Project Outcome initiative, in 2016, RCPL plans to launch outcome surveys to evaluate performance against new national standards. Parents and caregivers who participate in early literacy programs and activities will be asked to share data about what they learned; their confidence level in helping children learn; the amount of time they spend reading, singing, talking, writing and playing with their child; and their awareness of library programs and services. These surveys will not only provide documentation of the difference library programs make in the lives of children and families, but will also allow RCPL to benchmark itself against other libraries nationally and to discover the best practices of other high-performing libraries. Next up for RCPL are plans to use grant money to roll out a 1,000 Books Before Kindergarten program, as well as further develop the library’s outreach efforts. This will include offering storytimes in the community health center’s dental clinic and acquiring portable play systems to add a gross motor component to programming. One thing is certain: RCPL’s staff is passionate about supporting childhood development and literacy in their community. We’d love to hear how you’re promoting your passion and supporting your community through early childhood programming. Share your success stories and your questions in the comments below.